September 18 is the 261st day of the year(262nd in leap years) in the Gregorian calendar.There are 104 days remaining until the end of the year. AD 96 – Nerva is proclaimed Roman emperor after Domitian is assassinated. 887 – Venetian Doge Pietro I Candiano dies in battle against the Narentines. 1066 – Norwegian king Harald Hardrada lands with Tostig Godwinson at the mouth of the Humber River and begins his invasion of England. 1454 – Thirteen Years' War: In the Battle of Chojnice, the Polish army is defeated by the Teutonic knights. 1679 – The Province of New Hampshire is separated from the Massachusetts Bay Colony. 1714 – George I arrives in Great Britain after becoming king on August 1. 1739 – The Treaty of Belgrade is signed, whereby Austria cedes lands south of the Sava and Danube rivers to the Ottoman Empire. 1759 – French and Indian War: The Articles of Capitulation of Quebec are signed. 1793 – The first cornerstone of the United States Capitol is laid by George Washington. 1810 – First Government Junta in Chile. Though supposed to rule only during the Peninsular War in Spain, it is in fact the first step towards independence from Spain, and is commemorated as such. 1837 – Tiffany & Co. (first named Tiffany & Young) is founded by Charles Lewis Tiffany and Teddy Young in New York City. The store is called a "stationery and fancy goods emporium". 1851 – First publication of The New-York Daily Times, which later becomes The New York Times . 1862 – The Confederate States celebrate for the first and only time a Thanksgiving Day. 1870 – Old Faithful Geyser is observed and named by Henry D. Washburn. 1895 – The Atlanta Exposition Speech on race relations is delivered by Booker T. Washington. 1898 – The Fashoda Incident triggers the last war scare between Britain and France. 1906 – The 1906 Hong Kong typhoon kills an estimated 10,000 people. 1922 – The Kingdom of Hungary is admitted to the League of Nations. 1931 – The Mukden Incident gives Japan a pretext to invade and occupy Manchuria. 1934 – The Soviet Union is admitted to the League of Nations. 1939 – World War II: The Polish government of Ignacy Mościcki flees to Romania. 1939 – World War II: The radio show Germany Calling begins transmitting Nazi propaganda. 1940 – World War II: The British liner SS City of Benares is sunk by German submarine U-48; those killed include 77 child refugees. 1944 – World War II: The British submarine HMS Tradewind torpedoes Jun'yō Maru , killing 5,600, mostly slave labourers and POWs. 1947 – The National Security Council and the Central Intelligence Agency are established in the United States by the National Security Act. It also establishes the Air Force as an equal partner of the Army and Navy. 1948 – Operation Polo is terminated after the Indian Army accepts the surrender of the army of Hyderabad. 1948 – Margaret Chase Smith of Maine becomes the first woman elected to the United States Senate without completing another senator's term. 1961 – U.N. Secretary-General Dag Hammarskjöld dies in a airplane crash while attempting to negotiate peace in the Katanga region of the Democratic Republic of the Congo. 1961 – CONCACAF is established as the governing body for association football in North America, Central America and the Caribbean. 1977 – Voyager I takes the first distant photograph of the Earth and the Moon together. 1980 – Soyuz 38 carries two cosmonauts (including one Cuban) to the Salyut 6 space station. 1981 – The Assemblée Nationale votes to abolish capital punishment in France. 1982 – The Sabra and Shatila massacre in Lebanon comes to an end. 1988 – The 8888 Uprising in Myanmar comes to an end. 1992 – An explosion rocks Giant Mine at the height of a labor dispute, killing nine replacement workers in Yellowknife, Canada. 1997 – The Anti-Personnel Mine Ban Convention is adopted. 2001 – The 2001 anthrax attacks begin. 2011 – The 2011 Sikkim earthquake is felt across northeastern India, Nepal, Bhutan, Bangladesh and southern Tibet. 2014 – Scotland votes against independence from the United Kingdom, by 55% to 45%. 2015 – Two security personnel, 17 worshippers in a mosque, and 13 militants are killed during a Tehrik-i-Taliban Pakistan attack on a Pakistan Air Force base on the outskirts of Peshawar. 2016 – The 2016 Uri attack kills nineteen Indian Army soldiers and all four attackers. AD 53 (LIII) was a common year starting on Monday of the Julian calendar. At the time, it was known as the Year of the Consulship of Silanus and Antonius. The denomination AD 53 for this year has been used since the early medieval period, when the Anno Domini calendar era became the prevalent method in Europe for naming years. 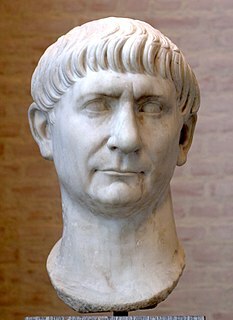 Flavius Claudius Constantinus, known in English as Constantine III was a Roman general who declared himself Western Roman Emperor in Britannia in 407 and established himself in Gaul. He was co-emperor from 409 until 411. Year 869 (DCCCLXIX) was a common year starting on Saturday of the Julian calendar. Eustorgius I was bishop of Milan from 343 to about 349. He is honoured as a Saint in the Catholic Church and his feast day is September 18. Saint Joseph of Cupertino, O.F.M. Conv. was an Italian Conventual Franciscan friar who is honored as a Christian mystic and saint. He was said to have been remarkably unclever, but prone to miraculous levitation and intense ecstatic visions that left him gaping. John Macías, O.P., was a Spanish-born Dominican Friar who evangelized in Peru in 1620. He was canonized in 1975 by Pope Paul VI. His main image is located at the main altar of the Basilica of Our Lady of the Rosary of Lima and is venerated by the local laity in Peru. A church was built in his honor in 1970 in San Luis, Lima, Peru. Saint Constantius is venerated as a member of the legendary Theban Legion. Similar to the cults of Saint Chiaffredo at Crissolo, Saint Bessus at Val Soana, Saint Tegulus at Ivrea, Saint Magnus at Castelmagno, and Saint Dalmatius at Borgo San Dalmazzo, the cult of Saint Constantius was linked with that of the Theban Legion to lend antiquity to a local saint about whom nothing was really known. Edward Bouverie Pusey was an English churchman, for more than fifty years Regius Professor of Hebrew at the University of Oxford. He was one of the main promoters of the Oxford Movement. ↑ Parsons, R. H. (29 January 2015). The Early Days of the Power Station Industry. Cambridge University Press. p. 7. ISBN 9781107475045 . Retrieved 17 September 2018. ↑ "Flooding in Nigeria kills 100". The Standard HK. 2018-09-18. Retrieved 2018-09-20. ↑ "Dr Ivy Matsepe-Casaburri". www.sabinetlaw.co.za. Retrieved 2018-02-19. ↑ Everett, Dianna. "SARTAIN, GAILARD LEE, JR. (1946 – )". Oklahoma Historical Society. Retrieved 22 September 2018. Wikimedia Commons has media related to September 18 .